This page is dedicated to all the businesses that have sponsored the Lakeland Hawks and the Lakeland Figure Skating Club through fundraiser donations, donated materials or time and other financial commitments. We cannot thank you enough and we encourage our visitors to support these businesses. A regulated electric and gas utility serving Wisconsin and Michigan and supporting our area youth programs. Hartree Partners, LP is a global merchant commodities firm specializing in energy and its associated industries. 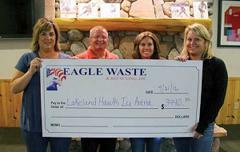 Eagle Waste and Recycling provides residential, commercial and industrial trash and recyclables collection and disposal for many Northern Wisconsin communities. With indoor-outdoor pools, slides and a kiddie play area, our fun waterpark is the largest in Northwoods and free for all hotel guests. River Valley Bank is a community bank offering personal and business banking services in the Minocqua and surrounding areas. Redman Realty Group - finishing #1 among the Greater Northwoods MLS. Let Pat Van Hefty Realty Group help you if buying or selling is in your future. Paint Your Own Pottery Studio plus a cool variety of art, pottery, soy candles, jewelry, and more! Offering Pork Tenderloin, Pulled Pork, Beef Brisket and Chicken smoked sandwiches fresh off the grill. 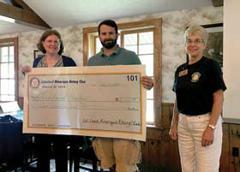 A non-profit group with the sole purpose to help create a safe community for our area youth. The leading supplier automated external defibrillator (AED) devices in the country, located in Woodruff. We grow cranberries exclusively and proudly for Ocean Spray Cranberry Cranberries, Inc. A grower-owned cooperative since 1930, located in Manitowish Waters, WI. We are your full service small engine repair shop. Whether it be tuning up your lawn mower or rebuilding your outboard engine, we can do it all. We service all makes and models of snowmobiles, boats, ATV’s and lawn equipment. Paddleboards, Kayaks, Bicycles, Rentals, Bike Repair, serving the Minocqua area. Adventure tours available from 1 day tours to extended tours. Rentals available. Quality Collision Center, the place to take your car or truck when a quality automotive body and paint are needed, quickly and done right! A family bar located just outside Minocqua, famous for their cinnamon roll french toast, biscuits and gravy and great food and service. A must! The Lakeland Times is a small town newspaper, great for keeping up on the local issues and supporting local youth sports in the Minocqua and surrounding communities. A global leader in engineered wood products, LP Building Products manufactures wood framing, siding, panels, and more. The Merrill Lynch Minocqua Office focuses on delivering wealth management strategies to high net worth individuals and businesses while delivering superb service. Northern Lakes Amusement, Inc. is your supplier for a wide range of amusement devices. We distribute and maintain jukeboxes, videos, pool tables, darts and more. Your Northwoods Property Management Team! We rent unique Vacation Homes, Cabins, Lodges and Pontoons in Vilas County, WI. Bobcat, Kubota, Stihl, Simplicity, Toro, Landpride Sales and Service in Woodruff, Wisconsin. Minocqua, Wisconsin Real Estate - Redman Realty Group is the leading premier realty group in the Minocqua area. Sam's Rental offers full service rental's specializing in Tent, Wedding, Party & Contractors. We are PROUD to be serving the Northwood's of Wisconsin. Find great grocery store deals, every week, at Save More Marketplace! Located at 8522 US Highway 51 N, Minocqua. (715) 356-9437. Life is an adventure, not to be missed, even for a moment. Live life the way you want to! That's what yoga can bring you! Yoga Retreats and Classes. Yoga classes and workshops in the Northern Wisconsin area. Leave feeling refreshed, accomplished, and with a greater willingness to show up and be the amazing person you are! Dumpster rental service in North Central Wisconsin. Working with both residential homeowners and contractors. Chef Rene's At Timber Ridge is located in Minocqua, WI in the Timber Ridge Golf Course. 715-356-7070. Fine dining, reservations appreciated. Timber Ridge Golf Club has been known as one of the top golfing experiences in Northern Wisconsin. This Par 72, Championship layout is an exciting challenge for all levels of play. Rustic bar & grill dining experience, located in Hazelhurst on County Y. Family owned and operated, supporting Hawks hockey! Call 715-358-8387. Our members from the greater Lakeland area strive to follow Rotary International's motto of "service above self." We are involved in local, national, and international services projects. Norwood Pines delivers the relaxed elegance of one of Northern Wisconsin's oldest and finest supper clubs. Located on Hwy 70 West on Patricia Lake. Located in Manitowish Waters, we feature an extensive sandwich menu, homemade soup and chili as well as homemade pizza. We have daily specials and a Friday Fish Fry. Indoor Cycling & Yoga Studio downtown Minocqua. Our ride takes you up challenging climbs and heart racing descents, then we engage your upper body using weight resistance. Village Market is your family supermarket that combines the very best of freshness and quality with traditional values and unparalleled service that only a neighborhood grocer can provide, located downtown Manitowish Waters. *Also a special thank you to the following families for their time and financial donations in support of Lakeland Hawks Hockey.